My sister is the one who told me about Universal Yums. We were on the phone and she was chattering on about some box with snacks from other countries, and how I had to try it, etc. I listened and agreed in the right places, but I didn't really have any intention of subscribing. As a matter of fact, even after I'd read about it and decided we might like to try it, I'm pretty sure I didn't subscribe until she was at my house one day. Yes, by then I was swayed, but I really only did it because she was standing right there and I had told her I was going to. What can I say? I dig familiarity. Snacks from new countries are not familiar. I like things I have always done, I like schedules and sameness, it's my jam. But, she mentioned it SO MANY TIMES that I was like, "hmmm." I mean, I do love food! I do love getting things in the mail! I have done other subscription boxes, and I do Walt Life now, so maybe another snack box might be cool. If nothing else, I thought I could sneak in a learning experience for my kids. ​After checking out the site, we decided we'd go with the Yum Yum box. At the time, it was their biggest box option, and since I knew I'd be sharing with three other people, two of which are growing boys, I figured more was better. The Yum Yum box description stated that it would contain AT LEAST 12 different snacks from another country each month. We found that the snacks were large enough to share between us, and if it was a pre-wrapped candy snack, there were always at least four in the box so we all got one. We ended up really loving Universal Yums (which I guess you can tell since I'm posting about it) and ended up switching over to the Super Yum box, which gives you at least 20 snacks from a different country each month. ​We love this box, love it! There's a video below where I talk about it, but I'm not saying anything I'm not writing. If you want to watch, you can, but if you're at work...(shhhh), just read. I don't want to say that every single item in the box is good. I mean, these are snacks from other countries. Those countries and cultures might enjoy flavors that you are not used to, and it can be a little odd. For instance, we once had Mastic candy from Turkey. It was literally like eating sap from a pine tree. :) If you're an adult, and you've had Gin, it was like eating Gin. But, the booklet told us a cool story about how Mastic used to be so precious that it was worth more than gold, and if you stole it, you could be killed. Someone really loves the taste of pine tree sap, or gin. It was FUN though. I can honestly say that even when I don't love something, it's still FUN! Most snacks taste exactly like things you'd enjoy, albeit in a different form, right here in the USA. You get candy, chips, chocolate, pastries, cookies, you name it, we've had it. We've even had items we were supposed to melt down to make a drink, and tablets you put in water to make them fizzy and sweet. I have never spit anything out, though I really wanted to with that Mastic, lol. Everything is very edible, nothing has been horrifying (the Mastic was close) and it's something the whole family gets super excited about each month when our new blue and white box comes in the mail. My kids love picking the snacks at night. It's changed our after dinner routine so much. Now, instead of heading to our separate spots to do whatever, we spend a half hour at the table talking, discussing foods and countries, and laughing. I'm writing this specifically for those of you who are worried about allergies. "The ingredients of each snack are listed on the booklet included in your box. Unfortunately, we are not able to substitute items for individual boxes. Please be aware that some products are manufactured in a facility that also handles common allergens such as wheat, peanuts, tree nuts, soybeans, eggs, milk, fish, and shellfish. If you have severe food allergies please do not purchase our product." If you have food allergies, I wouldn't even mess with it. Universal Yums is awesome, but it's not worth the risk. We have also had two "Holidays Around The World" boxes, one in 2017 and one in 2018. As to where we'll go next...we have the clue, but we can't figure it out, so I'll let you know when the box arrives! Scroll through the gallery below to see all of our country flags so far. Boxes ship automatically on the 15th of every month. Depending on when the 15th falls, and where you are in relation to the warehouse (Parsippany, NJ), shipping will take about a week, or five business days. I can safely say that I have always had my box in my hands no more than one week from the date I get the email telling me it has shipped. As far as I know, there is no Universal Yums coupon. That said, you do have different options with your subscription, monthly or yearly. If you choose the prepaid yearly option, you do get one free box each year, meaning you get 12 boxes, but pay for 11. So, if you think this box will be something you'll enjoy for a year, definitely do the yearly subscription and enjoy that free box. 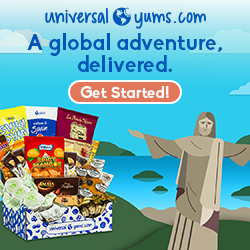 Update - Universal Yums just released a new referral program, yay! All you need to do is go into your account, click "Referrals" on the right side, copy your link, and share it with your friends. For each friend you refer, you'll get a $5 credit added to your next subscription payment, whether it's monthly or yearly. Just think, you could have your whole year paid for if you know enough people. This is brand new, how exciting! Universal Yums offers three different boxes at the time of this post. They are the Yum Box, the Yum Yum Box, and the Super Yum Box. Ignore the March 15th date on the box pictures. They update that picture each month so you know when your box will ship if you subscribe. It's always on the 15th of the month. Cancelling is easy, and is done right on the website, as opposed to other box subscriptions that make you call or email. Just go into your account, click on "Manage Subscriptions" and click "Cancel". I mean, I love this box and I don't see myself wanting to cancel it, but it's nice to know that if I want to, I can without jumping through hoops. I've been around the snack block with this snack box, so if you've got questions, don't hesitate to ask. In the meantime, I hope you love your Universal Yums! If you're looking for a subscription box that ships Disney park snacks to your door each month, check out Walt Life! I'll post about that box soon!